Custom hand made wood pens made with your cigar band! 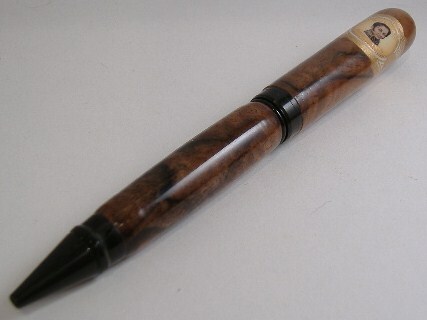 This unique hand turned cigar style pen is specially made to look like a cigar. Send me a cigar band from that special occasion so it can be with you wherever you go. Have you celebrated an event (bachelor party, wedding, baby's birth, graduation, promotion, family reunion) with a cigar? Save that cigar band and turn it into a useful memento to be cherished for years! 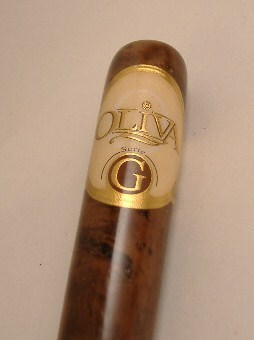 The look of the cigar is achieved by using walnut burl wood. The color and the grain of this wood simulate that of a Maduro cigar very well. The top of the pen is rounded so that it is a closed end. The cigar band is then attached on the pen and then several layers of finish are applied over top of it. This keep the band protected and permanently attached to the pen. The pen is accented with black titanium hardware, which provides an elegant and subtle look to the pen, truly one of a kind! These pens can be refilled with a Parker style ball point refill. 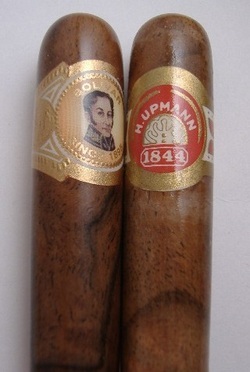 The price for this pen is $95 plus shipping and requires that you first send me your cigar band first. To order, please email us directly or you can order through our Etsy listing. Alternatively, you can order through this Paypal link and I will make a pen for you with a random cigar band that I already have. With this option the band will be chosen at random and you will not have the option to select one. I can attach a cigar band to many styles of pens, different hardware (like gold or chrome), or use different woods, to make it just right for you. Please email us directly or you can order through our Etsy listing.